Just upgraded to stainless steel appliances? Black switch plates and outlet plug covers are a great way to enhance the modern, contemporary look of stainless steel kitchens – minus the fingerprints. Complete your trendy avant-garde wall decor with coordinating black electrical devices, light switches and outlet plugs. With coordinating electrical devices, dimmers and power outlet receptacles in matching gloss or matte black finishes, you can create a gorgeous polished look in no time. 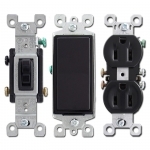 Black switches and receptacle plugs are available in a wide range of voltages and styles – ranging from antique push button models to energy saving motion sensor switches – so ample options are available when you need that hard-to-find device for a unique electrical application. This decorative black switch plate can add a subtle, yet fun splash of color to all-black decor. Want to add a colorful touch for children in your home? No problem – classy black switch plates can be personalized with decorative overlays and unique designs in a variety of colors and styles. A great kid-friendly way to personalize baby nurseries, bedrooms for girls and boys, playrooms, family rooms and more. If you’re a handy man or woman who enjoys do-it-yourself projects, try DIY Switch Plate Painting or Artistic Paper Covered Decoupage Switch Plates for creative solutions to updating your home decor.